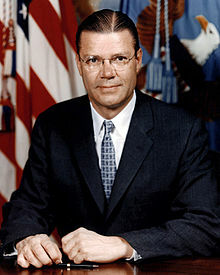 Robert Strange McNamara (June 9, 1916 – July 6, 2009) was an American business executive and the eighth Secretary of Defense, serving from 1961 to 1968 under Presidents John F. Kennedy and Lyndon B. Johnson, during which time he played a major role in escalating the United States involvement in the Vietnam War. Following that, he served as President of the World Bank from 1968 to 1981. McNamara was responsible for the institution of systems analysis in public policy, which developed into the discipline known today as policy analysis. I must say I don't object to its being called McNamara's War. I think it is a very important war and I am pleased to be identified with it and do whatever I can to win it. Management is the gate through which social and economic and political change, indeed change in every direction, is diffused through society. You can never substitute emotion for reason. I still would allow a place for intuition in this process, but not emotion. They say I am a power gabber. But knowledge is power, and I am giving them knowledge, so they will have more power. Can't they see that? It would be our policy to use nuclear weapons wherever we felt it, necessary to protect our forces and achieve our objectives. I would rather have a wrong decision made than no decision at all.